Sorry, Magic Flight Launch Box has been discontinued. 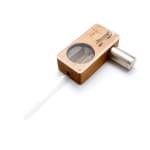 The famous Magic Flight Launch Box is the ideal vaporizer for someone looking for the most compact and easy to use herbal vaporizer out there. 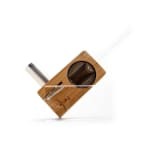 It is affordable compared to most of its more high-tech competition, is very discreet and compact, made of all natural materials (premium cherry wood and glass), and heats up in just 8 second while pressing a single button. It's ideal for the vaper on-the-go. The Magic Flight Launch Box kit includes the box itself, 2 rechargeable battery and their charger, the glass draw stem, a cleaning brush, user manual and gift box.